Miami icebreakerMiami has never seen anything like it before. It’s not me saying that, it’s Dr Andrew R Hirschl, respected dentist of that parish, and he’s talking about the exhibition, which opened at the Miami Science Museum last weekend, an exhibition that runs all the way to September. ‘Amazing, amusing machines combine art and science’ says the billboard, and they are, of course, the amazing machines of Cabaret. It’s a popular museum with 200,000 visitors a year and exhibitions that tour the States, but exhibitions curator Sean Duran was keen to find something different, something to take the place over the planning stage of a major new museum, due to open in 2014, and give folks a glimpse of how good it’s going to be. 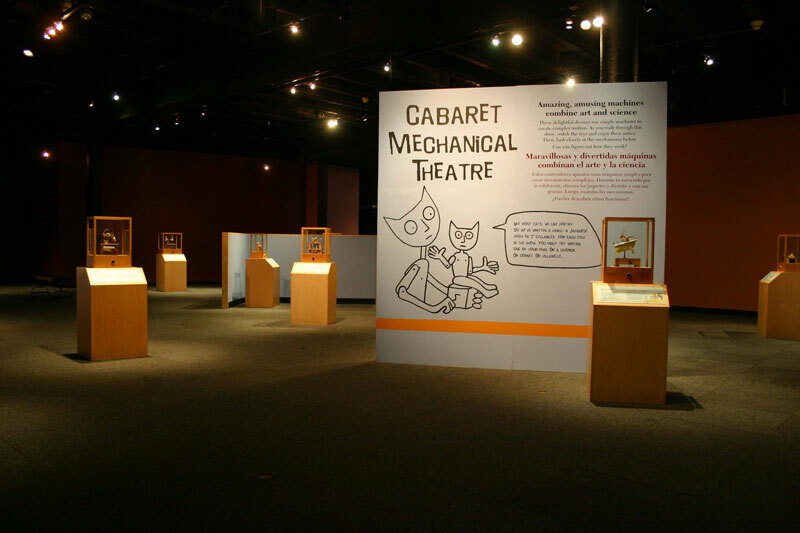 He went to Minnesota and saw the exhibition that would do it for him: Cabaret Mechanical Theatre, of course. As I write there are 20 pieces, plus workshops, drawings and talks, but that’s only half of it. The other half is where Doctor Andy comes in. This 55-year-old dentist from Miami B each also turns out to be a fanatical collector of automata. Even more amazing, he and Sean Duran lived in the same street and never met until our own Sarah introduced them – “That’s Miami for you” Sean says. They’re good pals now, though. So as of this weekend there will be another 20, on loan from Andy’s Toy Room as he calls it. He’s been a fanatical collector all his life, beginning with metal wind-up toys and then progressing to plastic versions, “but always mechanical, there had to be some human input to make them work” he says. “I think there’s a connection with dentistry – something to do with mending things on a human scale. After you find out how it works”. Then, 25 years or so ago, he and his wife saw a kit at a street fair in Miami, took it home and put it together. It was a couple kissing. “It was something, easy to put together, but it started something.” The next was a political cartoon in the shape of an automaton of President George Bush the First having a punch-up with General Noriega, also not very subtle. “But as collectors will, I started looking around for what else there was, and I found Sue and Sarah”. He hasn’t stopped to work out what the collections is worth, but now there are over 100 life-scale automata, and 80-odd tiny micro-automata. 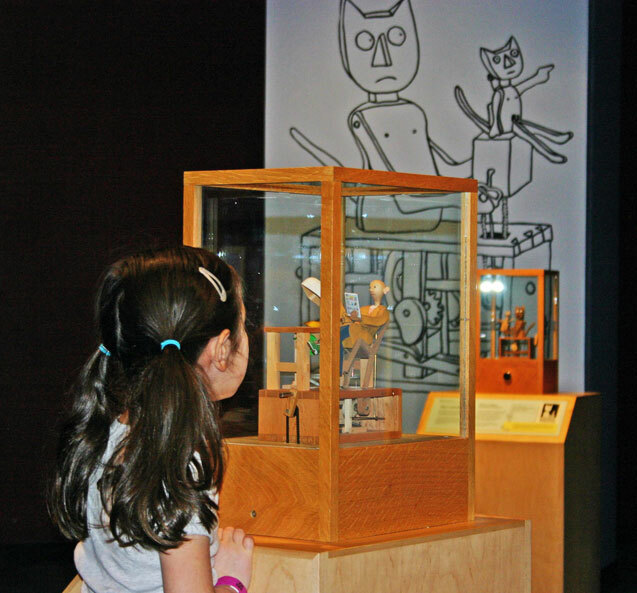 And he’s full of glee – good word for automaton lovers, you can’t be one of those without being gleeful at the prospect of some his ‘toys’ going into the exhibition. “This is a young city, and I want the exhibition to give our people a taste for another form of beauty they didn’t know existed”. Did you see our Sarah on Laurence Llewellyn Bowen’s latest décor show for ITV, House Gift? Larry and his pals invade an unsuspecting household and compete to buy them something they didn’t know they wanted to make the place look better. One went for antique lamps, one for plastic trays, Lal turned up at HQ CMT – “absolutely sensational” said LLB about what he found there – and fell for Keith Newstead’s lovely, golden, Mermaid, last of an edition of five. Sadly, the giftees went for the lamps, though, well, they do live in Crouch End, what would you expect? If you’re in the UK you can watch the show on the ITV Player until the 5th March. Next month the £6m Discover Greenwich exhibition is going to be unveiled and among other things it will use a mechanical theatre to reveal interesting bits and pieces about the history of the site of the old Palace of Greenwich. Actually, by CMT standards, it’s pretty crude, but it’s a step forward from those awful dummies with flickering film of talking face s projected off-centre onto the figures heads. So eight-inch high figures on a small proscenium stage in turn talk about their memories of the place: William Pickering, the first armourer, on making Henry’s enormous metal carapace; Anne of Denmark on starting the Queen’s House in the park; Holbein, the portrait painter; William Peto who preached in the friary church next door against the Boleyn marriage and had to take a long day trip to Belgium as a result; Thomas Tallis, Henry’s favourite composer whose music you can here fluting about the place; and finally Grace O’Malley, a lady pirate who came to Greenwich to get Queen Elizabeth’s protection from the authorities, got it, and went back pirating. Fun, but what a Ride of Historical Life it could have been! Rob Higgs’s fantastic corkscrew (see the December blog) is haunting me. Is he ever going to sell any? So I ring up Rob’s presence on earth, Michael Young of Oneofonehundred which is flogging the incredible machines. Of course it’s doing marvellously, he tells me. It’s a limited edition of 100 and he’s sold, well, two. Not so bad, though, when you know that each one costs £100,000. Michael won’t tell me who’s bought them, but neither buyer is in this country. And they’re both restaurants.